GREEN LAKE, Wis. — Shame on me. This golf writer of nearly 50 years didn’t know nearly enough about the work of William Langford until playing in last week’s Langford Shield outing at The Links of Lawsonia. Langford was a Chicago golf architect and very prominent in his profession. He and partner Theodore Moreau were the course designers. The Links of Lawsonia course didn’t open until 1930, and it has had a partner course, Woodlands, since 1985. It was designed by Rocky Roquemore, who participated in the design of Cog Hill’s Dubsdread course in Lemont. The Langford Shield outing was created by newly-named management company Oliphant Golf to celebrate the opening of the new Langford Pub and underscore the work that Langford did as a course architect. He worked on over 200 courses nation-wide. 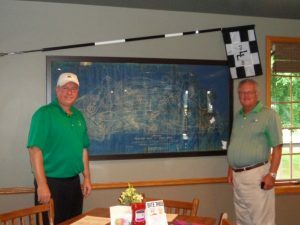 Big-Three golf website partner Rory Spears and I were only middle-of-the-pack in the inaugural playing of the Langford Shield, a two-man team event that is expected by be held annually, but the experience was first-rate. Lawsonia had been long-recommended, but last weekend was my first visit there. Gary D’Amato, long-time friend and well-respected golf writer for the Milwaukee Journal Sentinel, calls it “one of the top five courses in Wisconsin.’’ That’s saying a lot, given all the positive developments going on in Wisconsin in recent years. Lawsonia isn’t one of those new developments, but it has had a most interesting history. It was eventually purchased by the American Baptist Assembly and was closed in the 1940s so the property could be used to house German war prisoners. 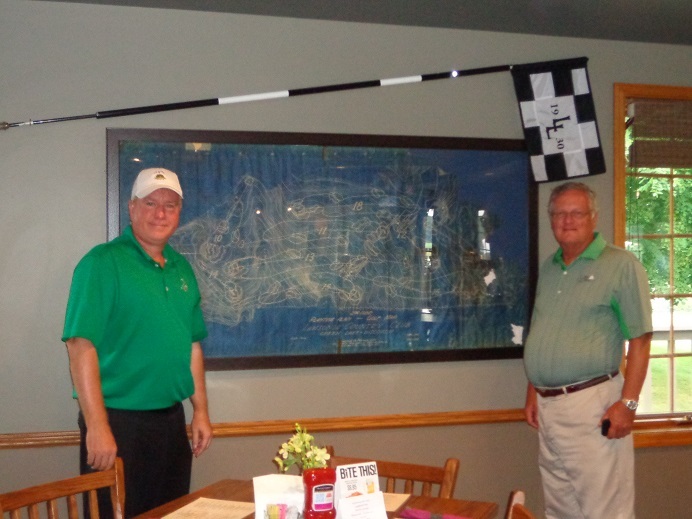 Langford Shield partner Rory Spears (left) and I got a look at the original course design when Langford’s Pub opened. From the golf side, though, this course is a real treat. I learned that most of the holes were built as replicas of holes in Scotland and the par-3 seventh apparently has a boxcar buried underneath it to create its extraordinary elevation. There may also be a boxcar under the practice range. At any rate, Langford’s reputation alone merits a visit to Lawsonia. He was long based in Chicago and his works there include Barrington Hills, Bryn Mawr, Butterfield, Glen Oak, Park Ridge, Ruth Lake, Westmoreland and Skokie. At the outing, though, I learned that he had a special fondness for public golf and many believe The Links at Lawsonia is his best work in an extraordinary career. Oliphant Golf, formed in 1996 and based in Scottsdale, Ariz., has done over 150 construction and renovation projects, but hasn’t been all that active in the Midwest. 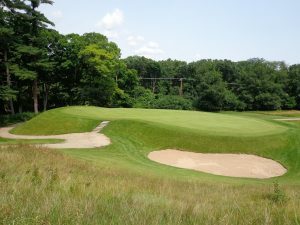 Ten of its projects, none in Wisconsin or Illinois, were honored in Golf Digest’s rating categories.